Click the video below to see Justin perform on David Letterman and testimonials. Click the picture below to see reactions to Justin's episode of the World's Greatest Tribute Bands on AXS TV! Picture of Justin, Not Elvis! Hear Justin's incredible voice performing with the Blackwood Brothers Quartet and the Sweet Inspirations! Watch Justin sing the National Anthem at NASCAR for 150,000 people with the Million Dollar Quartet! 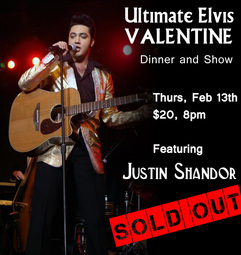 Click on poster to see Justin's SOLD OUT performance at Peppermill Casino! Makes front page of USA TODAY!!!! 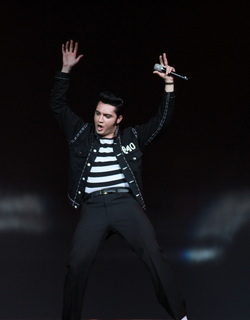 THE GOAL - TO RECREATE AN ELVIS 70'S SHOW - PERFORMED JUST THE WAY IT WAS. Justin has been making a living impersonating Elvis since he was 16 years old. 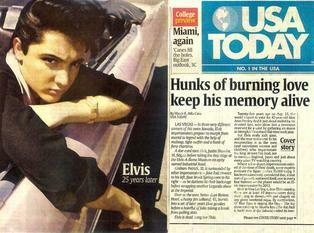 In August of 2010, he won the Ultimate Elvis Contest in Memphis, TN, securing an endorsement from Graceland. 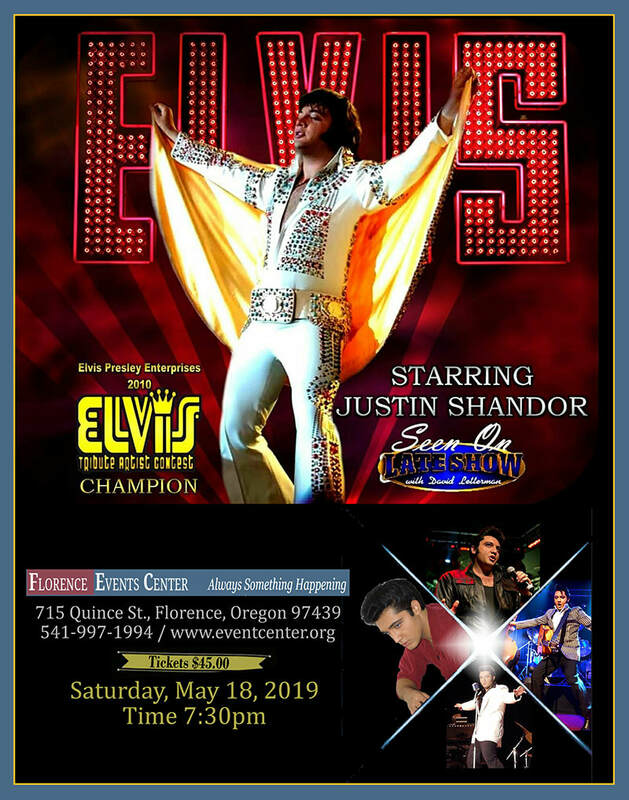 Immediately after wining the contest, Justin and his manager, Jamie (of Jamie's Rock and Roll Legends) hired some of the best Elvis musicians in the country and added horns, gospel backup singers, and an extra guitar player to produce the best Elvis 70's concert in the world. The response has been overwhelming. Giant sold out crowds, standing ovations during and after the songs, women crying, and rave reviews from fans and the media. 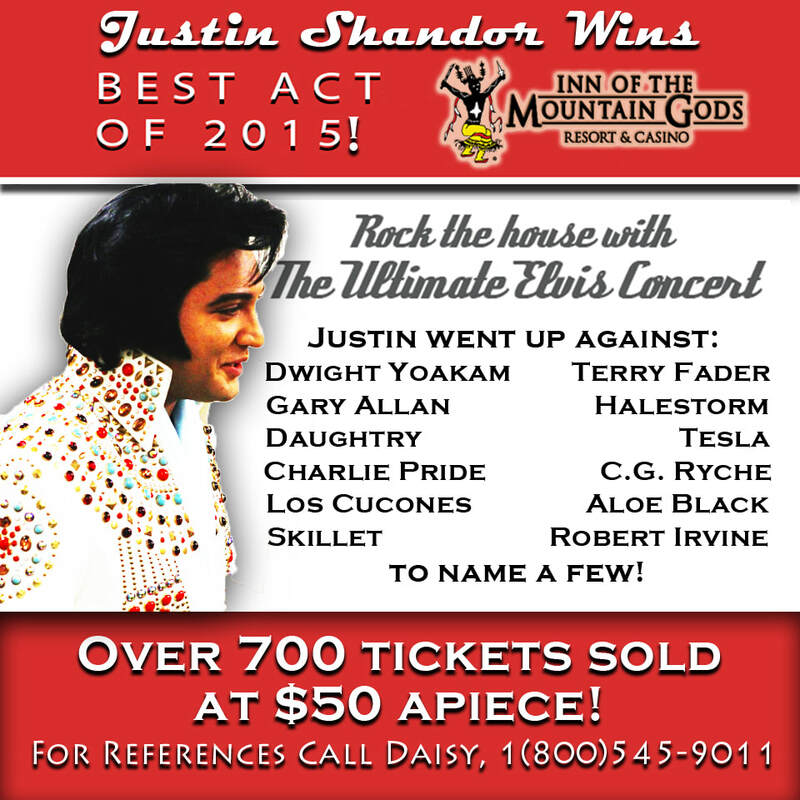 We have been getting dozens of phone calls every week asking for promotion on "The Ultimate Elvis Concert". Years of concerts, touring, and countless hours of practice ensure that the vocals, drum beats, and dynamics are the spitting image of a 70's Elvis Show. Words are cheap. See for yourself the shocking accuracy of Justin's voice, moves and gestures in comparison to the King at his peak by watching the clips below. 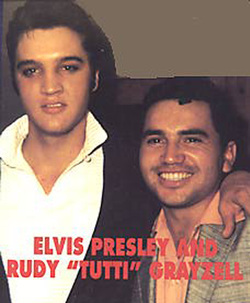 Elvis's original opening act, Rudy Tutti, after meeting Justin for the first time: "I never thought I'd see that face again... Unbelievable!"